porches, parks and party BOO! October October October, what are you doing to us?! We wanted to be wearing our knee high boots and complicated scarves by now! Nonetheless, the fabulous Environs team decided to take a second, closer look at the fine local eating establishments in Decatur, this time looking for places off the beaten track. Nothing stops these guys - don't miss their latest reviews! And, as always, at Environs, we value you, your time & your business and look forward to being able to stay in touch with each of you! Have a Great Day. The Oakhurst Porchfest - A Fab Saturday Distraction! Dawn and her mom and friends header over to the 2nd Annual Porchfest in Oakhurst earlier this month, and they just fell in love. Aside from wanting to introduce it to Midtown in the future, she also wanted to tell y'all about it so you can visit next year if you missed it in 2016. Learn about the Oakhurst Porchfest from Environs' own Dawn Landau. Atlanta is just full of pocket parks (it's not just a cute term, its usually a small park created on a single vacant lot or small pieces of land). In cities, pocket parks can make all the difference, not just for us and our pets but wildlife too + they increase the value of your homes! Here's our write up on some of our favorite pocket parks in Atlanta. Monday Night on Oct 31st. Enter via 5th street alley. $20 a couple or family - Pay at the party! View the Event Poster. 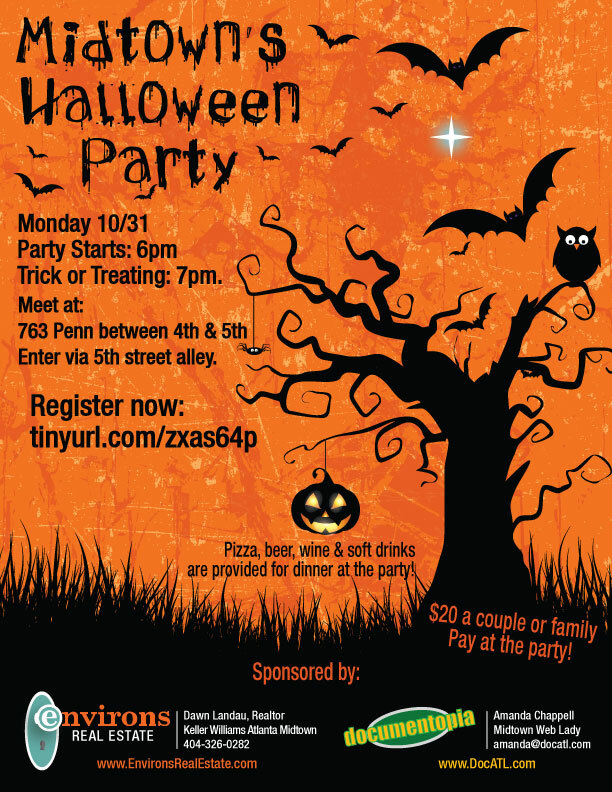 Sign up and take the family to a fun Midtown Halloween Event! These reviews are quite mouth-watering, and eye-opening if you thought Decatur was just the square! Call today for an appointment to see this lovely home. 404-326-0282. View the full listing here . Incredible Penthouse Level condo in perfectly located Park Central! Upgrades include stainless appliances, granite counters (kitchen and bath), wood floors throughout, window treatments and lighting. his building offers some of the best amenities in Midtown inc. INDOOR and OUTDOOR POOLS! Walk everywhere from this home on Juniper and call it YOURS today! FHA Approved building. These gorgeous brand new townhomes from the Environs Residential Team have beautiful wide open living spaces and 10' ceilings on the main level. With a front porch AND rear patio, private rear yard, drive under 2-car garage, Kitchenaid appliances, Hansgrohe fixtures, HUGE master suite and a bonus room on the garage level...it's just about everything one could want in a house. And then there's one of the most sought after things in American City living right now: YOU CAN WALK EVERYWHERE! Call today for an appointment to see this awesome home. 404-326-0282. View the full listing here. On November 8, 2016 voters in Fulton County will consider a 5-year TSPLOST, and City of Atlanta Voters will consider a 5 year TSPLOST and a MARTA transit sales tax. This article from the Council for Quality Growth has everything you need to know before you vote! Work is (finally) Underway at the Clermont!!! For residents of Poncey Highland, the renovation of the Clermont Hotel into a boutique hotel could not have come soon enough. A great step up for this neighborhood that borders Ponce City Market and the Beltline! Since our leaves are falling, many of us rush to clean the gutters on our homes but forget the street "gutters" or in Atlanta, the curb. Not only do clean curbs add "curb appeal" but keeping the street free of debris improves our storm water system and helps prevent flooding. Grab your blower and yard tools and hit the street! Now the weather has cooled and we can actually tolerate being outside and getting things done, it's the perfect time for tackling your Fall Maintenance Checklist! Read this great article from House Logic with 10 Fall Maintenance Checklist items!